A long-abandoned Armenian church can be seen in the Karakoy neighborhood of Istanbul, Turkey, on one of the busiest streets of the largest city in the country. 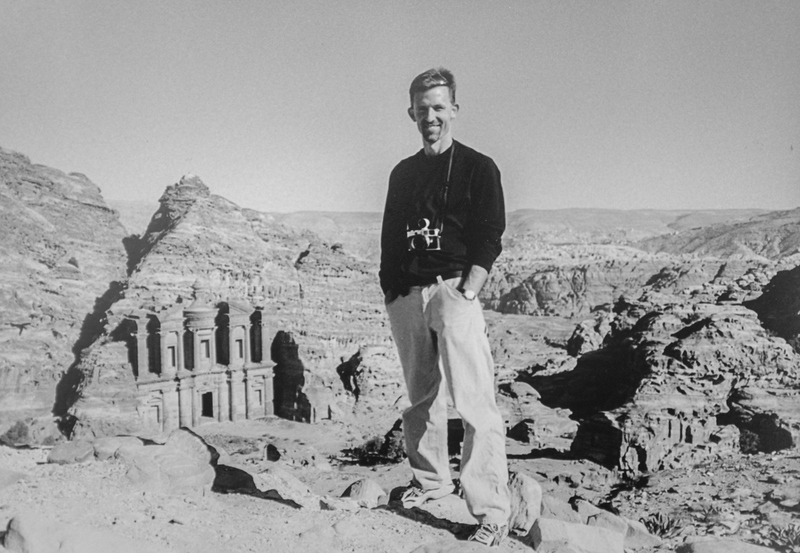 In September and October 2001, I traveled throughout Turkey for more than three weeks. It was one of my greatest trips ever. I loved the country and really enjoyed my experiences getting to know the Turkish people. I recommend the country to anyone. During that trip, I worked on a photo-documentary project, visiting historic locations of the Armenians. I also visited many other places too, from ancient monasteries, to Greek and Roman ruins, to the wonders of the Ottoman Empire, to Kurdish regions that were experiencing disturbances that have not fully settled to this day. I did a lot of research before this trip, and received a lot of assistance from some Armenian colleagues I befriended as a result of my interest in photographing remnants of the Anatolian Armenians, who experienced the first clearly documented case of genocide of the 20th century. I do not wish to get into a larger discussion of that topic. I am republishing a story, with photographs, that I published first in 2002. It recounts my travels to historic locations linked to the genocide and Armenian history in present-day Turkey. I finally got around to publishing this story again, after finding some materials I had forgotten about–the story told through numbers. Since I work in public health these days, I find myself steeped in data and perhaps a bit beholden to it. So with that frame of view, I present a “by the numbers” perspective on my travels in Turkey, this significant crime against humanity, and a point of view that I try to keep in focus when I get lost in the small stuff and forgot the important stuff. My story, An Armenian Journey, is in PDF format, and because of its large file size at 25 mb, it may take a while to download. Please be patient, as it well worth your time. A very useful map of the tragic events is published by the Armenian National Institute. A fine collection of historic prints and illustrations of now vanished Armenian communities in the Ottoman Empire in present-day Turkey can be found on the Houshamadyan web site. That site shows pictures of many of the places I visited, and you can compare historic pictures with the pictures I show in my story. 1.5 Approximate number of persons, in millions, estimated to have been murdered during the genocide against Armenian citizens of the Ottoman Empire during and after World War I. .6 Approximate number of Armenians, in millions, that the Turkish government today claims died during World War I during what the government called a military uprising. 35 Number of Armenian churches still active in Istanbul, according to a custodian at the Kilisesi Vakfik in the Galatasaray neighborhood of Istanbul. 100,000 Approximate number of ethnic Armenians residing in Istanbul today, according to members of the Holy Mother-of-God Armenian Patriarchal Church, in the Kumkapi neighborhood of Istanbul. 30 Approximate distance, in meters, from the Kumkapi police station to the Armenian Patriarchate (main church for Armenian Christians in Turkey). 5 Number of recognizable historic Armenian religious structures in Erzerum that are either labeled Selcuk or unknown origin. 2,549 Number of Armenian ecclesiastical buildings in the Ottoman Empire (churches, monasteries, parish structures), according to a survey by the Armenian Patriarchate of Constantinople in 1914, on the eve of the genocide (source, William Dalrymple, From the Holy Mountain). 464 Number of Armenian ecclesiastical buildings in the Republic of Turkey that had disappeared from the total of only 913 structures with known whereabouts in 1974, according to a survey done of the buildings that year (source, William Dalrymple, From the Holy Mountain). 252 Number of Armenian ecclesiastical buildings of the 913 buildings with known whereabouts that were in ruins, according to a survey done in 1974 (source, William Dalrymple, From the Holy Mountain). 197 Armenian ecclesiastical buildings of the 913 buildings with known whereabouts that were in sound shape, according to a survey done in 1974 (source, William Dalrymple, From the Holy Mountain). 0 Number of references to “Armenia” or “Armenians” at Ani, the historic cultural capital of the Bagratid Armenian kingdom in eastern Anatolia on the border of modern-day Armenia and inside Turkey. 1/2 Number of surviving Armenian structures in present-day Kozan, called Sis by the Armenians, and the capital of their kingdom in Cilicia in the 13th and 14th centuries and formerly seat of the Armenia Catholicasate. 0 Number of references to Armenia on signs next to these structures. 350 Approximate number of mosques (including the great Suleymaniye and Selimiye mosques), bridges, and buildings credited to the Armenian architect Sinan. 1 Number of Armenian religious buildings remaining in Harput, the center of the graphic, first-hand account of the genocide by American diplomat Leslie Davis called The Slaughterhouse Province. 4 Number of monument structures at Liberty Hill in Istanbul to honor Talaat Pasha and the Young Turks, the principal architects of the first genocide of the 20th century. 0 Number of signs outside the now locked and gated memorial indicating the contents inside the weed-covered area originally built in 1943 to honor the former Turkish leader, who was gunned down in Berlin in 1921 by an exiled Armenian, Soghomon Tehlirian (in 2001). 2 Number of military points passed prior to entering the Ani complex. 3 Number of government and police offices required to complete an Ani application process (taking a quick one hour of time, in 2001). 25 Approximate cost, in U.S. dollars (as of October 2001), to visit the historic Ani ruins. 0 Number of road crossings open to commerce and road travelers between Turkey and present-day Armenia (in 2001). 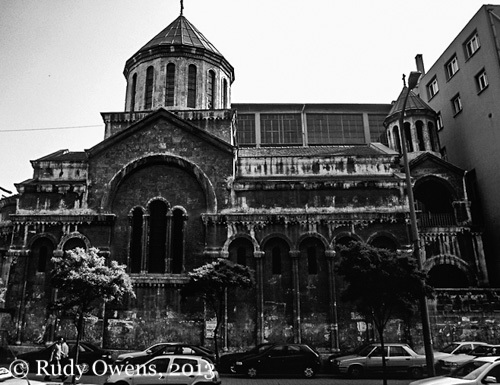 6 Number of Armenian churches I visited in Istanbul that are now permanently closed. 0 Number of references to “Armenia” or “Armenian” at Akdamar Church, an Armenian church outside Van on an island in Lake Van. 53 Number of days more than 4,000 Armenian villagers in the Hatay Province south of Antakya, on Musa Dagh (“Mountain of Moses”), resisted Ottoman forces in 1915 before they were rescued by Allied warships. 18 Number of languages that Franz Werfel’s best-selling account of the famous siege and rescue–Forty Days of Musa Dagh–has been translated into since its first publication in 1933. 24 The day every April that Armenians the world over mark as their genocide anniversary day, commemorating the date in 1915 that 600 leading Armenians and another 5,000 Armenians in Istanbul were rounded up, and almost all killed. Benedikt then goes on to argue that people who abandon public K-12 education undermine the foundations that make for a healthier, more democratic society. In defense of her seemingly provocative view, she claims that the bad things she did with bad kids during her public school days taught her more about life than reading Walt Whitman. In the end, she pleads with the middle-class moms and dads of the country reading her piece to go to bat for public schools in the most visceral way. There’s a big public health story here too, but first, let me give some personal background and why this resonated profoundly with me. I have friends who send/have sent their kids to private schools, and I do not think they are bad. But having attended K-12 public schools my formative years, I am very biased to Benedikt’s point of view. It’s my tribe, those public school grads. You might call me a bulldog on this point. My mother was a public school teacher as well, so I know the exhausting and harsh down sides from the perspective of such educators. The most important things I learned about life are the ones I clawed together in that often chaotic petri dish, and at times it was chaos too. While I think many aspects of U.S. public schools truly stink, mainly the large mega schools and school systems that reward jocks and criminally fail to prevent abusive bullying of all stripes, I cannot deny the value of socializing in this publicly-funded mosh pit provides. 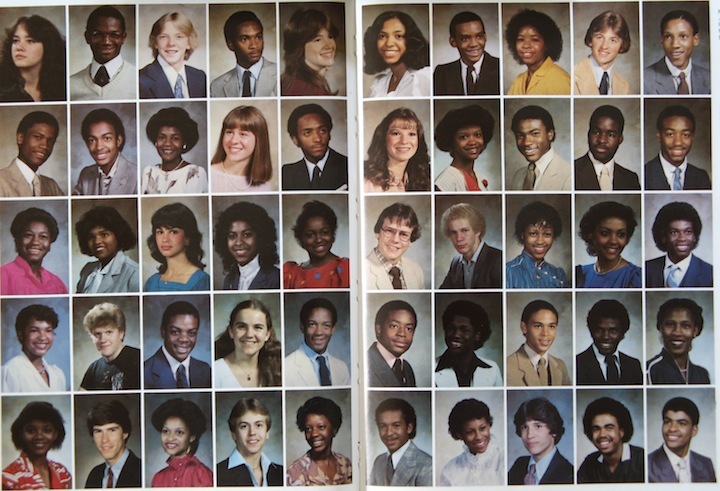 A snapshot from my graduating class of 1983 from University City Senior High School; yes I’m in there, bad hair and all. The system I attended til 1983 in University City, next to St. Louis, was good (in some ways), but very divided in terms of who was on the fast track to say a great music college and who was on the fast track to say joining the armed forces. Both paths seem good to me now, and I was among those without a clear path. People came from respectable professional families (the ones whose parents were high-earning types like doctors) and from those living on the margins. The realities of race, and in my mind class, were omnipresent. During my years in that system, grades 3-12, the student population was roughly 70% black, 25% white, and 5% all other (Latino, Asian, Middle Eastern). There were great teachers, and awful ones. There were clicks, stoners, nerds, punks, jocks, super achievers, motorheads (people I respected the most), future criminals, future drop-outs, future business people, musicians, and hip hop artists. Violence lurked in many places, too. I saw three extremely violent and criminal assaults (two on campus, one off) during a several-year stint. I experienced more than my fair share of racial harassment, and I was hospitalized after being cold cocked on a school setting—a crime I partially brought on myself, but also with racial undertones. But hey, who says high school is supposed to be walk through the flowers? 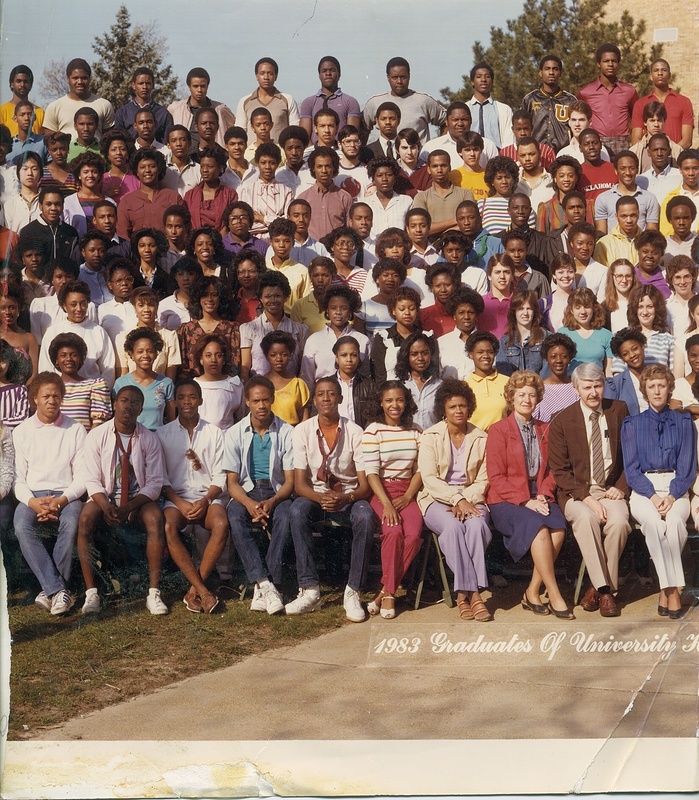 A group shot from my 1983 graduating class; I am not seen in this one. In the end, I would not trade this for anything. All of this gave me the tools to deal with an increasingly diverse country, where skills at communicating cross-culturally matter in every professional setting, and in most personal interactions too. In a more fundamental way, I felt equipped to stand my ground and hold my own anywhere in the world, and really appreciate people on their own terms. It gave me a window to really get to know people. Today, however, it is more likely students finishing their K-12 education will not have experienced something like what I did—a school that has true racial and cultural diversity without deep segregation at the district level. According to a 2009 report by the University of California at Los Angeles’ Civil Rights Project, schools in the United States are more segregated today than they have been in more than 40 years. Worse, millions of non-white students are trapped in so-called “dropout factory” (public) high schools, where large numbers do not graduate and remain unprepared for the challenges of an increasingly knowledge-based economy of technological haves and have-nots. While our nation has come a long way since the Brown v. Board of Education Supreme Court case of 1954 made it illegal to segregate schools based on race, there are still many problems. A typical example is in Richmond, Va., where a recent news report found that 40 years after the U.S. Supreme Court rejected consolidation of public school districts to achieve racial integration in the Richmond area, one in every three black students in the Richmond-Petersburg region attends a school with a population that is at least 90 percent black and 75 percent poor. So what right-minded parent, black or white or brown, would want their child in a school that is segregated and all but likely underfunded? It is a non-starter, really. The U.S. Department of Education’s data show private school enrollment has dropped, mostly due to declining attendance at Catholic schools. According to the U.S. Department of Education in 2008, the number of public schools in the United States outnumbered private schools (including religious schools) by about a 5-1 margin (65,990 vs. 13,864). 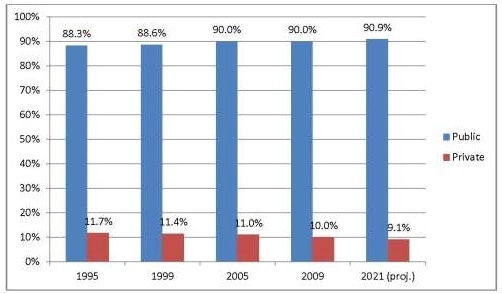 In the past 15 years (1995-2009), private school enrollment actually dropped from 12% of all enrollment to less than 10%. The main reason is attributed to the drop in Catholic school enrollment. Economic downturns also led to falling enrollment. Due to the increasing decline of the U.S. middle class and the concentration of all wealth in the hands of a few Americans, the disparities have even worsened. Between 2009 and 2011, the mean net worth of the wealthiest 7% of households rose 28%, while the mean net worth of households in the lower 93% slipped 4%, according to a Pew Research Center. According to Jack Jennings, founder and former president of the Center on Education Policy, the real issue remains how well the nation will educate the 90% majority—the ones with increasingly less wealth—who are not privileged and have less resources and who comprise the majority of our public school student population. They will be the future soldiers, medical professionals, politicians, scientists, engineers, construction workers, and more. “If we want a bright future, we must focus national attention on making public schools as good as they can be,” Jenning says. At last count, about 49 million kids were enrolled in K-12 education, or nearly or a sixth of the U.S. population. So the debate about where we educate these youngest citizens and our up-and-coming leaders is about as important issue as any we face as a nation, and as citizens of our communities and country. So where should kids get the tools they need to prepare them for their life challenges, a turbulent economy that is divided by knowledge and technology, and the diversity in a country that will be less than 50% white by 2043. Navigating the nation’s ethnic and linguistic diversity will be as critical for someone running a small business as it will be for a highly trained medical professional serving patients with different ways of dealing with health care. Research over the past 20 years has generated countless studies consistently showing how a person’s health is driven largely by underlying factors, or the social determinants of health. In short, one’s education will predict a child’s future health as good as any other causal factor. So as a nation, if we also want to promote opportunities for everyone to achieve good health, as well as good jobs, there must be a public policy imperative to ensure that the poor, underachieving, increasingly non-white public schools do not get short-changed. Does that mean more blog posts and rants chastising liberal middle-class parents and taunting them? Perhaps that’s one way to raise awareness, as Benedikt tried and I think succeeded. But I’m less convinced parents of any race who want their kids to be learning Mandarin by age 8 and making high-def feature movies by grade 10 (like students do at the elite Annie Wright School of Tacoma, Wash.) will dare risk their child’s well-being for the larger social good. If parents are fortunate to be economically well off in that narrowing minority of “haves,” they will choose the high-price, high-quality schools like this leafy campus and pay tens of thousands of dollars for that rare privilege. Because I am not a parent, I can avoid this very hard decision, so I am very lucky. Such advantage-bestowed kids will undoubtedly go on to be successful leaders. But I am less inclined to believe they will be the right leaders, who have a visceral sense of what’s best for all of us, though many of them will be the ones driving the agenda in many of the organizations that impact us the most.